A cast-iron baking mold can get easily rusty and old over the years. Caked with dried and baked-on food, a once brand new cast iron pan can eradicate over time, pushing its owner to consider a re-seasoning. Seasoning is the term used for the added-on surface of the cast iron. This layer of fat is packed on overtime to help people cook without food sticking to it or allowing it to burn. Cast-iron baking pans and molds must be seasoned before being used for the first time and re-seasoned as necessary. This helps seal the pores of the metal to prevent sticking. To season a brand-new cast-iron mold or pan, heat your oven to 300 F. Then, wash the cast-iron in hot, soapy water. Rinse and dry thoroughly before applying a liberal coat of solid vegetable shortening to every nook and cranny. When you're done, place the seasoning on a baking sheet, open side up, and heat for one hour. Simply allow it to cool, pour off any remaining shortening, and wipe it clean with a paper towel. At this step, be sure to not wash it. Before pouring in the batter, apply solid vegetable shortening to every crevice, using a pastry brush. Then, flour and tap out any excess. Now, the mold is ready to be filled. After un-molding the finished product, don't wash it. Rather, wipe the interior with a paper towel and the exterior with a damp cloth. On subsequent uses of the mold, the mold must re-greased and heated for 20 minutes at 375 F. This is the case even when it has been seasoned. Reduce the oven temperature to 350 F and pour off any accumulated shortening. Then cool, re-grease, and flour before pouring in the batter. To re-season a mold or pan that's starting to stick, repeat step one. When re-seasoning a rusty or old cast-iron mold, start by heating the oven to 275 F. Then, clean the pan very well, making sure to scrub off any dried or baked-on food. Dry it thoroughly and coat liberally with solid vegetable shortening. Next, bake the pan in the oven for at least 15 minutes before taking the pan out of the oven and pouring out the excess shortening. Then, put the pan back in the oven for at least two more hours. Repeat this process at least twice, and more if the pan is really rusty. Make sure not to stack cast-iron molds or pans on top of each other. If you do so, they will get scratched and lose their stick-free properties. Additionally, to avoid condensation (and therefore, rust), don't store cast-iron molds or pans with their lids on. Now that your cast-iron mold or pan is ready for cooking, you can try a new recipe, like a pineapple upside-down cake. You could also try making a carnival treat, like deep-fried funnel cake. For something simpler, try baking crispy wafer cookies. To make a savory dish, a Polish-American breakfast skillet is perfect. Stop Dealing With Stuck Bread by Greasing That Pan! 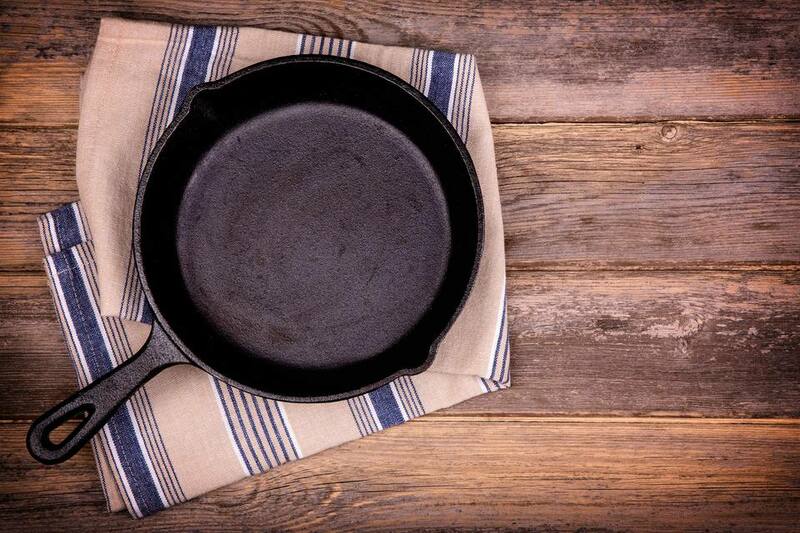 Wondering How to Clean Your Cast Iron Cookware? Are You Sure You're Storing Flour Properly?